An Post has now confirmed to Thures.Info, its move to a new flagship post office site in the Thurles Shopping Centre and the closure of its current Liberty Square business premises. We understand that the new office, which will open in the second half of 2019, will replace the current existing town post office at Liberty Square, which had been the company’s base for many years. The old Liberty square premises will then be offered for sale. All staff at the Liberty Square office presently, will transfer directly to this new office location. The new office will be in line with An Post’s ambitious transformation programme, offering a new look retail façade for customers, including a move away from old style post office counter layout. This is driven by An Post’s move to offer a host of new services and products to customers including financial services and integrating its growing eCommerce business. The new layout will include dedicated customers areas, parcel lockers and self-service options. The move comes as part of An Post’s effort to transform its post office network and to invest in improved facilities for customers in high footfall locations. Thurles, in fact, will become one of the first towns in Ireland, to host this new post office design, which is intended to improve the service offering to post office users and attract a new generation of customers. The new premises in Thurles Shopping Centre is anchored by Dunnes Stores and has a large number of other retailers including Boots, Eason, Vodafone, Eir, etc, and is located only about 500m from the current existing Branch Office. The shopping centre has a weekly footfall of some 55,000 consumers and boasts a free multi-storey car park with a large volume of available parking spaces. An Post has entered into an agreement with the owners of the shopping centre to lease the new premises in recognition of the need to provide a suitable location for customers and also in response to ongoing issues caused by the poor state and location of the existing location. An Post has found that any plan to revamp the current Liberty Square premises would be hampered by the condition of the three storey, listed property; the lack of available development space, and the prohibitive cost of overcoming any /all of these obstacles. The building had also been the subject of repeated complaints around accessibility and excessive queuing, caused by the lack of space within the office. This is another stake in the heart of the dying town centre. Surely the building has some potential to accommodate an post needs, extend premises to the rear or alternatively what about potential to lease or purchase adjacent property. The town centre is currently a glorified carpark, this needs to be put right and we need to put a heart back into the town centre not rip it out. Given the conditions of the building, there’s really not a hope in hell of saving it unfortunately. 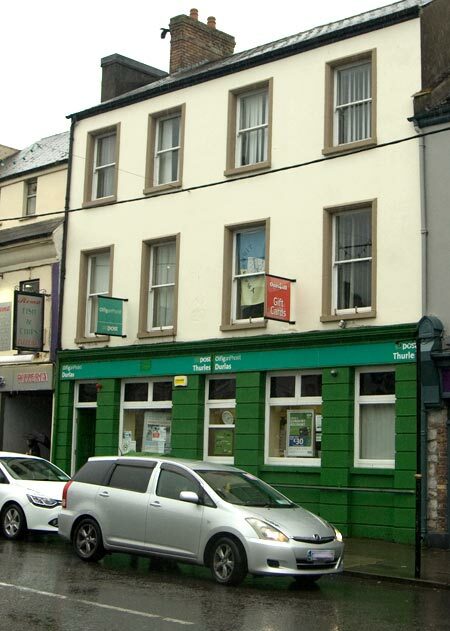 A compromise would be to have a smaller post office located somewhere on or near Liberty Square and the larger one in Thurles Shopping Centre. There’s a reason why Michael Lowry has resisted calls to advocate on behalf of saving it and that is he knows there’s no hope of making An Post change their minds (apart from everyone boycotting using their services which would be near impossible) or a change in planning laws.